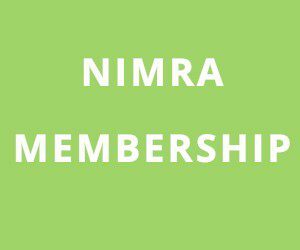 This year’s Annalong Horseshoe fell race was designated as a NIMRA championship long race, and attracted a record entry of 82 runners. 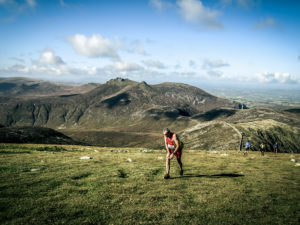 The race covers 13 miles and 5,000 ft of climb, starting at Dunnywater and goes in an anti-clockwise loop of the Annalong Valley, visiting Chimney Rock, Commedagh, Cove, Lamigan and Binian summits before a 1.5 mile road section back to the finish at Dunnywater. The marshals who placed the controls on the summits on Friday were complaining of getting sunburn but this certainly wasn’t the case on race day. The Mourne Mountains were shrouded in mist, with stiff winds and rain at the start area. Most of the runners started the race with their rain jackets on and all finished with jackets in place. The race started promptly at 11.00 and as the race organisers were returning to the marquee for a cup of tea and a two hour wait for the first runner to return, the first retiree appear back at the start, his race lasting less than two minutes before a pulled muscle put an end to his efforts. He was reminded of the ‘no refunds’ policy and accepted a conciliatory cup of tea and a bun in return. Willie McKee of Mourne Runners was the prerace favourite as he had been winning most of the early season races, with current Ben Nevis champion Diane Wilson also showing a return to winning ways in this early part of the season. True to form, McKee was leading a group of 6 runners through the first checkpoint on Chimney Rock, all within a minute of each other. In the ladies category, Wilson and O’Kane were out in front and within seconds of each other. As they headed off to the second checkpoint at the summit of Commedagh, the mist got lower and visibility reduced to 20-30 metres. At the Commedagh checkpoint, the leading group of male runners had reduced to five, with McKee still just out in front. Behind them, all sorts of navigational mayhem was developing in the mist. In the ladies category, Wilson had arrived at the start of the race with all of the correct compass bearings to enable her to navigate the route in the mist written down. Unfortunately for her, not all in the correct order. At the Chimney checkpoint, Wilson set her compass bearing and headed off in the mist, over the ridge and towards the quarry on the Bloody Bridge path. Never one to use her own compass and map when there is somebody to follow, O’Kane followed in her footsteps, both well off course. They were by no means alone in this respect – what should have been a 30 minute leg to the next checkpoint turned into a fifty minute slog. One runner even took the very scenic route to Commedagh via Donard summit. To make matters worse, a vicious hail storm arrived to give the struggling runners something else to overcome. At the manned marshalling position after the second checkpoint, McKee was still leading his group of five runners on their way to checkpoint 3 on Cove. Gillian Wasson of Ballymena Runners was leading the ladies category, her navigational skills giving her a fourteen minute lead from BARF’s Jackie Toal. At this stage a few runners had had enough and recognised that the elements and conditions weren’t in their favour and opted to retire, making their escape down into the Annalong valley and back to the race start/finish area. There was still navigational challenges to overcome for some runners after the checkpoint on Commedagh, some runners had cause to be grateful for the marshal’s vocal powers. At the front of the field, McKee continued to lead a group of five runners through the next two checkpoints on Cove and Lamigan. As they headed for the final checkpoint on Binian, McKee pulled out a five minute gap on the others in his group on the climb to the summit. He stretched this lead by another minute on the run to the finish, recording a finishing time of 2:14:11. Gary Bailey of Mourne Runners made good use of his descending powers to move from fifth to second place on the final descent, dispite a heavy fall. Colm Campbell of Newcastle was third and first Veteran. Dale Mathers was the leading V50 in 6th place in a time of 2:32:12. In recent years Jim Patterson of Newcastle has made the V60 class in this race his own preserve. However, he’s no stranger to navigational mishaps and this race proved no exception. There is an uphill finish to this race and Patterson found himself catching leading V60 runner Stuart Cunningham of Mourne Runners, resulting in a sprint finish for the line, with Cunningham the victor in a time of 3:12:01 by only three seconds. In the ladies race, Gillian Wasson held a comfortable seven minute lead at the final checkpoint over Hazel McLaughlin of Lagan Valley. As they headed for the finish, Wasson was starting to tire, with the fast descending McLaughlin closing the gap between them very quickly. Wasson crossed the line in first place in a time of 3:08:50, with McLaughlin in second place, having closed the gap to a mere six seconds. Jackie Toal of BARF took third place, less than a minute covering the top three places. Congratulations to all of the winners. Of 82 starters, we had 73 finishers and all retirements safely reported back to the finish. Many thanks to the B.A.R.F. organising club, in particular to all of the marshal’s out on the course, some of whom had to brave the extreme elements for over five hours. More importantly, thank you to all the runners, who came to the race with all the necessary kit and skills to complete the course in challenging conditions. This was the first time ever in this race that all runners passed the kit check first time with no rejections. Though a few could improve their use of map and compass.